Some readers of Excavated Shellac are undoubtedly familiar with the CDs “The Music of Madagascar” on Yazoo, and “Madagascar: Musique de la côte et des hauts plateaux” on Fremeaux. Both contain a wealth of utterly stunning historic recordings made from ca. 1929 to the late 1930s*. Many of the performances on these CDs contain the unforgettable sound of the valiha, the traditional Malagasy plucked tube zither (and pronounced vahLEE). I highly recommend them both. Yet, there were recordings being made in the country of Madagascar at approximately the same time – in 1931, by Odeon, on site. 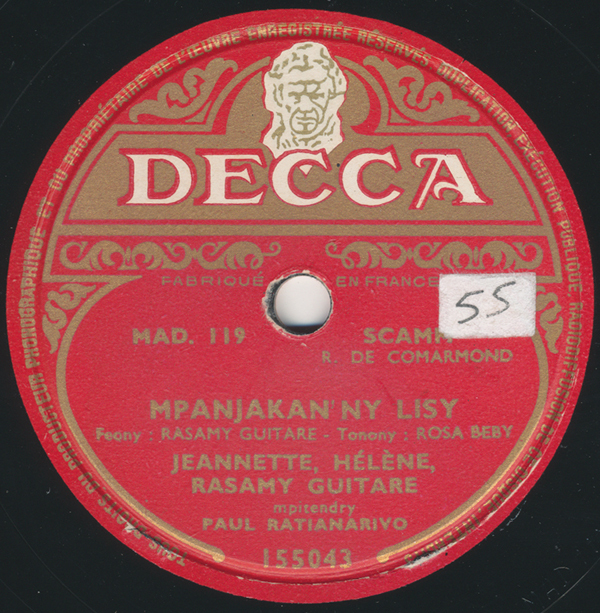 While their catalog was diverse, the Malagasy Odeon series contains numerous examples of a style of music that was quite prevalent by 1931, and which virtually overtook the Malagasy 78rpm market from the 1930s onward. It’s called kalon’ny fahiny, or “songs of the past” – and is a song type deriving from theatrical Malagasy operetta. Malagasy music varies across the island nation, and has been influenced from so many sources – East Africa, Europe, Indonesia, and even Yemen. Compared to other traditional music from Africa, it is often described as more melodic, or “lyrical,” because of some of these influences. Kalon’ny fahiny songs certainly fit that description. The style is primarily from the high plains of the country, and the theatrical tradition is still practiced today in major cities of Madagascar. Some have said that, during the mid-20th century, 78s themselves were seen as symbols of modernity in Madagascar, and helped to encourage a marginalization of traditional representations on record. However, that’s not to say that the kalon’ny fahiny songs were not unique in their own way. While the style was clearly influenced by western sources, it still retained the unique Malagasy singing (called angola). It featured piano, yet the piano playing was often sharp and staccato, sometimes sounding like an imitation of the valiha. The 78rpm industry in Madagascar blossomed after those initial Parisian recordings in the 1930s, which, I believe, were marketed mainly to the French. Besides Odeon, the Polyphon label also recorded traditional groups in Madagascar. HMV soon began again, recording on-site, as did Decca – and from what I can tell, those two held a large share of the market and mainly recorded kalon’ny fahiny tunes. Soon, there were independent labels in Madagascar, such as Decco, Decaphone, Tiana, Discomad, Rova, Ossian, Colombe, and others. 78s were still being pressed in the 60s in Madagascar – Discomad, for instance, was launched as late as 1959, in the run-up to the country’s independence. One of the most popular early theatrical groups was N Tropy Jeannette, or “Troupe Jeannette.” Their lead singer was the very same Jeannette on this recording. She is considered a national treasure. N Tropy Jeannette recorded for everyone, even touring France in 1929. * Fremeaux’s collection lists 1929-1931 as recording dates, although the discs contain 6 tracks from the Clérisse expedition. Fremeaux states this expedition was in 1930, although I believe this is in error, and the expedition was in fact in 1938 or 1939 (one of my sources states 1939, while two others list 1938 as the date). At any rate, those Clérisse recordings were not issued on shellac until 1946, and apparently only in a run of 50 copies. Yazoo’s collection does not contain exact dates for the tracks, but from what I can tell they were from HMV, Pathé, and Polydor recordings (and possibly more), dating from ca. 1931 to the mid- to late 1930s.